Every so often, my wife and I like to get away for a little relaxation. We’ve previously gone to A Tuscan Estate in McMinnville, OR, The Ivy Wild Inn in Wenatchee, WA, and to the Cave-B Inn in George, Washington. This time, we decided to go not-quite-so-far from home, and headed up to the Salish Lodge, in Snoqualmie, WA. The grandparents came out to watch the kids, and we headed out Saturday morning. 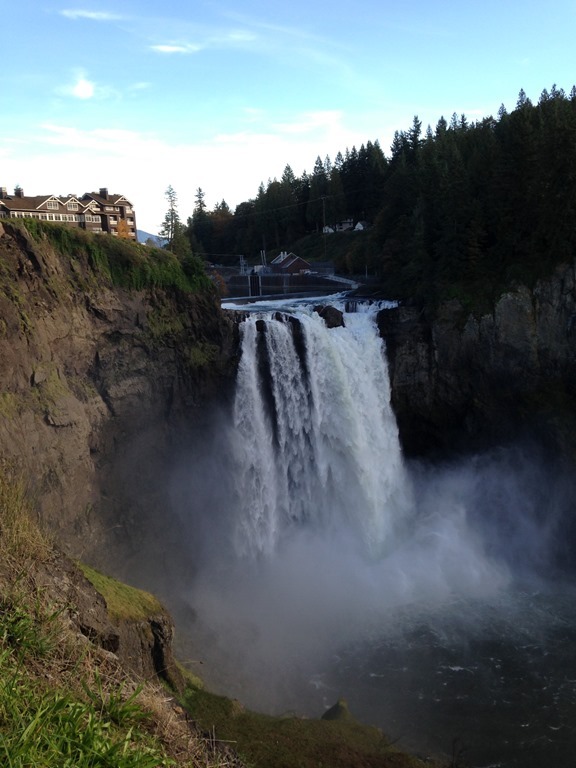 As you can see from the picture below, the lodge is situated directly above the 268 foot Snoqualmie Falls. The lodge above looks tiny compared to the falls, but it’s really a pretty large place. We only stayed one night, but we did manage to squeeze in hour-long massages for both of us, followed by a rest in their warm water pools and a sauna. For dinner I had the chicken with some of the best brussel sprouts I’ve ever had. My wife had the black cod. We awoke this morning after a good night’s sleep in a comfortable bed, and headed down to a delicious brunch. I had the biscuits and gravy; my wife had the eggs Benedict. The food was quite good, though a bit rich and heavy. The prices are steep, but the experience enjoyable. I even had an hour this morning while my wife slept in, to go down to their library and work on the editing of my book. Getting away every once in a while is a great thing to do. I highly recommend it. Admittedly, the Salish Lodge does chew into your budget with rather big teeth, but if you have the funds, and just want to be pampered for a night, it’s pretty close to Seattle and worth the trip up.